The Environment Agency is inviting Castleford residents to comment on an environmental permit application for a proposed renewable resources facility in Wheldon. Clean Power (UK) Limited have applied for an environmental permit to allow them to operate a site which will treat non hazardous municipal and commercial waste at a disused railway site by the Castleford to York railway. The company propose the site will generate electricity for up to 8,000 homes and reduce landfill waste in the local area. Following the submission of the permit application the Environment Agency have begun an in depth technical assessment, which may take several months before a decision is reached. A facility can only begin treating waste if it has been granted both planning permission and an Environmental Permit. Once we receive an application we are legally required to consider it, even if the site doesn’t currently have planning permission. Residents can visit and inspect the Environment Agency’s register between 9.30am and 4.30pm, Monday to Friday, but they must first phone the Environment Agency’s National Customer Contact Centre on 03708 506 506 to arrange an appointment. Comments on the application should be submitted by 13 June 2014 by email to pscpublicresponse@environment-agency.gov.uk or by writing to Permitting and Support Centre, Land Team, Quadrant 2, 99 Parkway Avenue, Sheffield, S9 4WF and quoting EPR/DP3936EY/A001. Clean Power (UK) Ltd is in the process of applying for planning permission to develop the site. This application can be found on the Wakefield Council website. 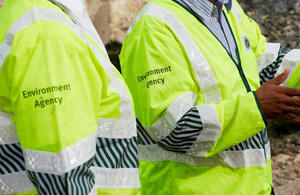 As part of the process the Environment Agency will be consulted by Wakefield Council.